PARTNER CONTENT: The need for low cost, accurate and reliable measurements has never been more important. Data is fast becoming a cornerstone of every energy project. It could be used to measure wind resource during project development, to maximise output from the plant or to test and verify existing or newly installed turbines. To meet this demand for large volumes of high quality data, developers and owners are turning to now established Light Detection And Ranging (Lidar) measurements to replace or supplement met-mast measurements. 1. The quality of the data you receive. With a Lidar, you receive a comprehensive data set that minimises vertical and horizontal measurement uncertainties associated with traditional masts. 2. Using a Lidar can remove the uncertainties associated with traditional mast-based campaigns such as flow distortion, cup calibration and seasonal issues. 3. The Lidar also removes the need for certain planning permits that would be required when working with tall mast structures, as well as removing the and health and safety concerns over working at height when installing, maintaining or removing a mast. 4. Lidars are a more resilient solution to traditional met masts. Robust methanol fuel-cell-based modular remote power supplies are used that are designed and proven to operate in the harshest of environments, all to ensure maximum data availability. 5. Lidars provide greater flexibility thanks to their portable design. If you need to take measurements across a range of locations, you can just make a request and within a couple of days, your Lidar will be in a new location. 6. Lidars can measure a wider area than stationary met masts. Either they can measure beyond proposed turbine hub heights, giving a fuller picture of the wind resource. Or they can measure several hundred meters ahead of the turbine rotor to ensure the machine captures the best winds. Lidars produce huge amounts of data, which gives a precise overview of the project but a lot of work get the best from it. 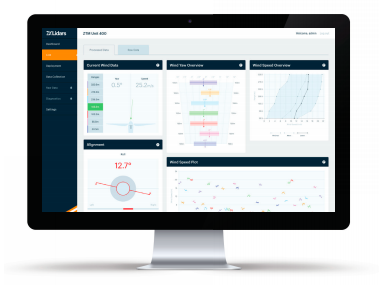 Through the introduction of ZX Lidars’ new subsidiary, ZX Measurement Services, they can provide every energy project with the wind data analysis developers (and bankers) need through an innovative industry model: Wind Data as a Service. With this, customers gain access to the latest Lidar technology and expertise without increasing overheads through capital expenditure or recruitment.